Two AIMS races were held on 31 December: The 56th Sao Silveste de Luanda (more) was run through the streets of the Angolan capital; across the Atlantic the mother of all new year events, the 87th Sao Silvestre de Sao Paulo (more) (15km) took place in South America's largest city. The St Catherine's Marathon, usually held on 31 December within the shadow of Mount Sinai, was cancelled. The first AIMS event of 2012 was the Neujahrsmarathon (more) in Zurich, in the very first hours of New Year's day. Next day, on 2 January, the Mizuno Hong Kong Half Marathon Championships (more) was run beside the Plover Cove Reservoir in the New Territories. The Semi Marathon International de Laayoune (more) took place in the south of Morocco on 25 December. 21 December: The international athletics federation IAAF has ratified the world record mark of 2:03:38 by Patrick Makau (KEN) at the BMW Berlin Marathon on 25 September 2011. Also ratified was Makau's world record for 30km recorded during the same race as a split time. You should run the Athens Classic Marathon at least once. Start at Marathon, the birthplace of the event, pass by the Tomb of the Athenian Warriors and climb the long uphill route to 31km before spending the final 10km in excited anticipation of entering the Panathinaikon Stadium. The Athens Classic Marathon has always been a very special race, yet the 28th edition in 2010 was uniquely significant as it coincided with the 2500th anniversary of the Battle of Marathon and the birth of the Marathon legend. This special event was captured in the official photographic album for the 28th Athens Classic Marathon, available through the www.themarathonroute.com e-shop. It is a remarkable photographic tribute of 656 pages, published under the auspices of the Greek Ministry of Culture and Tourism, the General Secretariat of Sports, the City of Athens and the Hellenic Athletics Association. A collectors' book about the 2500th anniversary of the authentic Marathon course, it is published by Grey Images in co-operation with the Hellenic Athletics Association. This volume has proved a photographic and design marathon in itself. Thousands of images required extensive editing and processing in order to cover all aspects of the course. 19 December: [To get to grips with] the real history of our sport, I recommend the AIMS Marathon Museum of Running in the 1936 Olympic complex in Berlin writes Roger Robinson in the latest edition of Running Times. It's still being developed, and there's no lavish technology, but its modest displays of memorabilia, photos and captions are genuinely expert, and tell you a lot about the beginnings of the marathon and the development of women's running. Even more important, behind the scenes is a jam-packed archive that will be a priceless resource for researchers. The driving forces are historian Gerd Steins and the Berlin Marathon's founder, Horst Milde, but there's a major American connection in the rich collection recently donated by Dr. David Martin of Atlanta. That's the same Dr. Dave whose scientific mastermind helped Americans to two unexpected medals in the 2004 Olympic marathons, the same Dr. Dave who co-authored the best two books on marathon history, and the same Dr. Dave who's the leading expert on exercise physiology, and a coach, statistician, and much else. Dave, 72, is sadly in poor health, but his huge lifetime contribution to running will continue indefinitely, in the 800 books and bound magazine volumes he sent to Berlin, as well as memorabilia that include a complete set of Peachtree Road Race finishers shirts. He hasn't finished. When I was going to Berlin in September, he asked me to deliver a folio of letters from the early years of the women's marathon, which he vigorously supported and helped to develop. If you're one of those, for instance, who doubt the supposed 2:46:32 world record in 1977 by little-known Australian Adrienne Beames (omitted from some lists), Dave's files might persuade you she was for real. That's what museums, archives, libraries and historians like David Martin are for. They help the future get things right. On 18 December the Fubon Taipei Marathon (more) was run in Chinese Taipei, and the Pisa Marathon (more) in northern Italy. On 11 December two AIMS races were held at opposite ends of the earth: Nara Marathon (more) in Japan at 140 degrees East and Powerade Monterrey Marathon (more) in Mexico at 100 degrees West. 09 December 2011: The BMW BERLIN MARATHON, to take place on 30 September 2012, has already sold out. Registration started on 20 October and closed on 6 December 2011 almost nine months ahead of the race date. The field is limited to 40,000 participants. The last 1,000 entries were connected with a charitable donation for projects helping children (42,195 euros). There are a few entries left as reserved packages handled by travel agents. In 2011 the race sold sold out seven months in advance. The BMW BERLIN MARATHON for inline skaters on 29 September 2012) is still open for registration. The BMW BERLIN MARATHON is recognized as the fastest marathon worldwide with seven world records in the past 13 years. The last one was set on September 25th, 2011 by Patrick Makau of Kenya (2:03:38 hrs). The Red Sea Aqaba Marathon (more) took place in Jordan on 2 December. On 3 December the Reggae Marathon (more) was run nearby Negril, Jamaica. 4 December is one of the year's busiest race days, with 16 events being held, mainly in the Far East and in the Caribbean. The 65th Fukuoka International Open Marathon Championships (more) were staged in Japan, The Toray Cup Shanghai International Marathon (more) and the Macau Galaxy Entertainment International Marathon (more) were run in China, the Angkor Wat International Half Marathon (more) in Cambodia and the Standard Chartered Singapore Marathon (more), in the world's most densely populated country and the Pune International Marathon (more) in India. The Lisbon Marathon (more) was held in Portugal (Europe), the Pampulha Lagoon International 17.8km road race (more) in Brazil (South America), the Rock 'n' Roll Las Vegas Marathon (more) in USA and Gran Maraton Pacifico (more) in Mexico ( both North America) but five events took place in and around the Caribbean: The Run Barbados Marathon (more), the St Croix International Marathon (more), the Cayman Islands Marathon (more), the Costa Rica International Marathon and Half (more) and the 35th edition of the Panama City International Marathon (more). The Pharaonic 100km (more) was run in Egypt on 25 November from the Sakkara Pyramids to El Faioum. The Malta Challenge Marathon (more) started it's three-day programme then as well with an 11.195km opening leg, with 6km and 25km stages on following days. On 27 November there were no less than 14 AIMS events on four continents. The Lake Kawaguchi Marathon (more) was held in Japan, the Unicef Charity Half Marathon in Hong Kong, and the Hyderabad 10km and Airtel Delhi Half Marathon (more) in India, where three men ran under the hour and four women beat 67:30. The Commercial Bank of Ethiopia Great Ethiopian Run (more) took place in Addis Ababa, and the Blom Beirut Marathon (more) in the Lebanese capital. Other events spanned the length of the Mediterranean, from the Cyprus Aphrodite Half Marathon (more) to the Divina Pastora Valencia Marathon (more). The Firenze Marathon (more) was won by Ethiopians Berge Bekele and Aisha Gigi, with Gigi recording the fastest women's time of the day, 2:31:36 . North of the Pyrenees, on Atlantic shores, John Komen won the Marathon de La Rochelle Serge Vigot (more) with the men's fastest time of the day, 2:07:13. The Marathon Donostia - San Sebastian (more) was held a little further to the south, across the Spanish border. In North America the 21K Nuevo Leon (more) and the Puebla Marathon (more) were run in Mexico, and the Amica Insurance Seattle Marathon (more) took place on the west coast of the USA. The Antarctica Ice Marathon, at 80degS, was run on the White Continent on 30 November (weather permitting). 21 November: Entries for the 2012 Old Mutual Two Oceans half marathon closed in a record time of nine days on Friday 18 November 201. The biggest field in the half marathon’s history will line up on Easter Saturday, 7 April 2012. No late entries will be accepted and entries posted after Saturday 19 November will be rejected. No refunds will be considered. Those runners who missed out on an Old Mutual Two Oceans half marathon entry will have the chance to bid for one when 21 charity entries go up for auction from Wednesday 23 November, as part of a major fundraising initiative for the TOMI official event charity foundation. A record field of 16000 runners will take part in the half marathon, making it by far the biggest half marathon in the country. Just over half the entrants are women (8380) and 8280 of the runners will be running the half marathon for the first time, while 80 runners will be running their tenth race. 8334 runners are from the Western Cape with the remainder coming from all over South Africa. 262 runners from Africa will be taking part together with 236 international runners. Over 10000 are unlicensed and do not belong to a club. Just over 1000 entries have been received for the ultra marathon and most of these entries are expected early next year, once the runners have qualified. Entries for the ultra marathon close on 7 March 2012 or when the 11000 entry mark is reached. Entries for the trail runs will open on 18 January 2012, and trail enthusiasts wanting to secure their spot in this popular event will need to enter as soon as possible, as entries sold out in less than a day for the 2011 event. Participants can enter online at www.twooceansmarathon.org.za or download an entry form from their website. On 19 November the Medio Maraton Turistico Riviera Nayarit was held in the Mexican seaside resort of Puerto Vallarta. The 24th Standard Chartered Bangkok Marathon has been postponed from 20 November 2011 to 12 February 2012 due to the recent severe flooding in Thailand. The race programme on 20 November started with the Yokohama Women's Marathon (more) in Japan, followed by the Allianz Penang Bridge International Marathon (more) in Malaysia. The Marathon des Alpes Maritimes Nice-Cannes (more) took place along the French Riviera, and the 7th edition of the Quito 21k Mitad del Mundo (more) in the High Andes. The Marabana (more) event in Cuba celebrated its 25th anniversary and in USA the Philadelphia Marathon (more) and the Big Sur Marathon on Monterey Bay (more) presented different scenic aspects to participants: historic urban or Pacific coastal. 16 November: Liliya Shobukhova has won the AIMS/ASICS Athlete of the Year Award. She becomes the first Russian athlete to win the coveted award, following on from last year's winner Mary Keitany. ASICS Russia’s Marketing Manager, Natalia Lapochkina, presented Shobukhova with the Golden Shoe Trophy during a short handover ceremony in Moscow on Wednesday 16 November. Shobukhova, who turned 34 on Sunday (13 November), has a long career in athletics spanning all surfaces and distances from 800m indoors to world cross country however her true talents lie as a confirmed endurance runner, particularly in the biggest of big city Marathons. In 2010 Liliya made a big breakthrough by winning the London Marathon in 2:22:00, and further improved six months later in Chicago to win the race and set an outstanding time of 2:20:25. In a year without any global championships, she finished the season having recorded the top two fastest times in the Marathon rankings. She continued to improve in 2011, running a personal best 2:20:15 in the London Marathon. In October she started the Chicago Marathon as heavy favourite and won for a third straight time in 2:18:20, claiming the 2010/11 World Marathon Major series in the process. Liliya’s astonishing time in Chicago set a new Russian record and has made her the second fastest female marathon runner in history behind world record holder, and former AIMS/ASICS Athlete of the Year, Paula Radcliffe. The AIMS/ASICS World Athlete of the Year Awards were founded in 1992 and are decided each year from nominations made by the 310 member races of AIMS. Previous winners include Liz McColgan (GBR), Uta Pippig (GER), Tegla Loroupe (KEN), Naoko Takahashi (JPN), Catherine Ndereba (KEN) Paula Radcliffe (GBR), Mizuki Noguchi (JPN), Lornah Kiplagat (NED) Constantina Dita (ROM) and Mary Keitany (KEN). 13 November: At the 5th AIMS Marathon Symposium held in Marathon on 12 November, participants addressed a medical theme. Paulo Afonso Lourega de Menezes, from the Rio de Janeiro Marathon, started proceedings by outlining the basic organisation of medical provision at a marathon, stressing the essential need for radio communication and mobile emergency provision. Despina Kardara, of the Athens Classic Marathon went on to describe a project that has been ongoing since 2008 to collect in-depth data from race participants and track the possible effects of marathon running on health in specific cases. The second session of the Symposium took place in the afternoon, after the Flame Lighting Ceremony at the Tomb of the Marathon Warriors. Pedro Pujol, from the Marato de Barcelona, summarised "What to do and what not to do", and the role of race organisations in advising entrants about this. He emphasised the need for communication with runners and the medical team about the precise conditions to be expected throughout the race. Gerhard Wehr, of the Vienna City Marathon followed, explaining the "digital emergency system" used in Vienna to prepare runners by keeping them informed. A voluntary registration scheme to record runners' medical details had attracted an encouraging rate of response. Christina Gratziou, of the European Respiratory Society described how a high profile event like the Athens Classic Marathon had been used to communicate an anti-smoking message, particularly through the influence of youthful participants in the shorter distances among family and friends. Inese Kikule, of the Riga Marathon spoke about how a medical incident concerning a high profile event ambassador led to uncertainty and confusion in the race organisation, and the need for clear communication guidelines to be agreed and enacted for such an eventuality. The final part o f the Symposium consisted of a description of the emergency medical provision organised by the Athens Classic Marathon, by Demetrios Pyrros, and its delivery along the course by NGOs working with the race organisation. Iosef Ntoumanis, of the Hellenic Red Cross, offered detailed insight into this, and again emphasised that the flow of information is critical to handling and reporting any cases that arise. The 5th AIMS Marathon Symposium took place in Marathon on 12 November, with a medical theme, featuring speakers from the Marathons of Rio de Janeiro, Barcelona, Vienna and Athens, and including and the lighting of the flame at the Marathon Tomb as part of the associated ceremonies. In the Athens Classic Marathon (more) on 13 November Abdelkerim Boubker took exactly one minute off the event record to win in 2:11:40. In the women's race Elfenesh Melkamu and Kamila Khanipova conducted a ding-dong battle over the last 3km, which Melkamu eventually won with a strong kick for home from just outside the Panathenaikos Stadium, 300m from home. The Turin Marathon (more) and the Garda Trentino Marathon (more) were run in the north of Italy. The Pan American 10km Rio (more) took place in Brazil. "The main purpose we are here today is most important for the organizations present here: the promotion of running in general and especially the marathon race. I would like to thank the hundreds of AIMS members and the millions of runners around the world that I am proud to represent here today; our sponsors for the trust they have in the running movement and our Association as the world entity representing them; the Greek Ministry of Culture and Tourism for giving us this great opportunity to establish our headquarters here in Athens - where better than where both the legend and the first marathon race originated? ; and to the people at the Hellenic Athletic Federation and the Athens Classic Marathon organising committee who have done so much to realise this achievement. "This alliance will help to bring tourists to Athens, and to the whole of Greece. Not any tourists but sporting visitors who deeply believe in such values as goodwill, friendship and solidarity with the intention of visiting the birthplace of the event that has had such an impact on their lives - the Marathon. We, AIMS, are here because we also believe in these values and we believe in the capacity of the country to continue to fulfill them. We will do our utmost to make this agreement a success for us both." On 4 November the Sharm El Sheikh International Half Marathon (more) was run through the Ras Mohamed National Park, on the fringes of Egypt's Sinai desert. On 5 November the Taroko Gorge International Marathon was run through spectacular scenery in Chinese Taipei. On 6 November the programme started with the JoongAng Seoul International Marathon (more), and continued on the Chinese mainland with the Hangzhou International Marathon (more). Action then shifted to Iberia, where the 5th Zaragoza International Marathon (more) took place in Spain and the EDP Porto Marathon (more) in Portugal. Further south the Semi Marathon International de Laayoune is run in Morocco and across the Atlantic the Bass Pro Conservation Marathon (more) was staged in Springfield, Missouri. The Navi Mumbai Barefoot Marathon, also scheduled for 6 November, had been cancelled and no alternative date yet announced. On 28 October the Amman International Marathon (more) was run in the capital of Jordan. The adidas Auckland Marathon (more) on 30 October included a crossing of the iconic harbour bridge during the race. The Osaka Marathon (more), following in the footsteps of the now not-so-new mass participation Tokyo Marathon, held its inaugural edition. The Standard Chartered Nairobi Marathon (more) in Kenya benefited from a pool of local talent striving for a chance to be noticed. In Europe the Podgorica Marathon (more) in Montenegro was run for the 18th time. In Switzerland the Lucerne Marathon (more) and the Lausanne Marathon (more) were run beside their respective lakes of Vierwaldstattersee and Lac Leman. In the German financial capital the BMW Frankfurt Marathon (more) promised to deliver another set of fast performances after last year's sub-2:05 winning time and did not disappoint. A magnificent final 5k by title holder Wilson Kipsang of Kenya fell just three seconds short of breaking his colleague Patrick Makau's marathon world record, set five weeks ago in Berlin. Kipsang clocked an unofficial 2.03.41, breaking his course record of 2.04.57 from last year. His colleague Levy Matebo set a huge personal best, to finish second in 2.05.15, as did another Kenyan, Albert Matebor, third in 2.05.23. Across the Atlantic the UWI-SPEC International Half Marathon (more) was run in Port of Spain, Trinidad, and the Marine Corp Marathon (more) takes runners on a sweeping scenic tour of the US capital. The National Lottery Dublin Marathon (more) took place on 31 October, an Irish national holiday. Much of the remainder of the day's action was around the Mediterranean, with Helena Kirop running the fastest women's time of the day in the 26th Venicemarathon (more) (2:23:37). Daniel Too and Lydia Kurgat won the Ljubljanski Marathon (more) held in the Slovenian capital in 2:08:25 and 2:33:01 respectively.. In Spain the Maraton del Mediterraneo (more) took place near Barcelona while the 21st edition of the Medio Maraton de Valencia (more) in its first running as an autumn event saw a fast and close men's race in which John Mwangangi beat Kenneth Kipkemoi 59:45 to 59:47. The Grand Marathon de Marrakech (more) was run in Morocco and the Niagara Falls International Marathon (more), started in Buffalo USA and finished on the Canadian side of the Falls, celebrating its 38th edition. 17 October: In the Scotiabank Toronto Waterfront Marathon on 16 October two astounding age bests were set. Fauja Singh became the first 100-year old to complete a marathon when he recorded 8:25:16 to finish in 3850th position, ahead of five other participants. Through his coach and translator, Harminder Singh, he said that he had "hit the wall" at 22 miles and taken two hours from there to complete the course.Resident in Ilford,, east London (UK), Singh started running 11 years ago after his wife and son died, and trains every day by running 10 miles. Born in India in 1911, Singh was a farmer in the Punjab but moved to Britain in the 1960s. He puts his stamina down to ginger curry, tea and "being happy". He holds the world record for the over-90 category after running the 2003 Scotiabank Toronto Waterfront Marathon in 5:40. Some distance ahead of him Ed Whitlock, a Canadian originally from UK, set an over-80 world record with a time of 3:15:51. He also holds the over-70 record, at 2:54 set in the 2003 Scotiabank Toronto Waterfront Marathon when he was 72 years old - the same race as Fauja Singh set the over-90s record. On 16 October Wilson Chebet ran 2:05:53 to win the the 36th edition of the TCS Amsterdam Marathon (more) in 2:05:53. The next five runners in all went under 2:07. Tiki Gelana won the women's race in 2:22:08. The Scotiabank Toronto Waterfront Marathon (more) ran into a blast of wind off the shores of lake Ontario but Kenneth Mungara still managed a sharpish 2:09:51, while Koren Yal, pushed much of the way by her young compatriot Mare Dibaba, recorded a very impressive 2:22:43. On 9 October Jafred Chirchir Kipchumba ran 2:05:48 to win the Eindhoven Marathon (more). Georgina Rono took the women's race in 2:24:33 and three more finished within a minute of her. In Europe activity centered on the Balkans, where the Bucharest Int'l Marathon and the Timisoara Marathon (more) took place in Romania, the Novi Sad Nis Marathon (more) in Serbia and the Zagreb Marathon (more) in Croatia. The Maratona d'Italia Memorial Enzo Ferrari (more) was run in Carpi while north of the Alps are the Munich Marathon (more) in Germany and the Eindhoven Marathon in the Netherlands. The Marathon do Algarve (more) took place in the south of Portugal and the Maraton de Buenos Aires (more) in the Argentinian capital. Rounding off the day were a trio of races in the Pacific Northwest: The Okanagan Marathon (more) in Alberta, the Goodlife Fitness Victoria Marathon (more) and the Portland Marathon (more). 2 October started with the Colombo Marathon in Sri Lanka, followed by six marathons in Europe. The 26th Spar Budapest Int'l Marathon (more) was run in the Hungarian capital while the 88th edition of the Kosice Peace Marathon (more) saw victories for Elijah Kemboi (KEN, 2:11:15) and Maryna Damantsevich (BLR, 2:33:53). The Sparkasse Three-Country Marathon (more), starting in Germany and finishing in Bregenz, Austria after a brief foray over the Swiss border, was won by Marco Kipchumba (KEN) in 2:11:18 and Susanne Pumper (AUT) in 2:36:21. Koeln Marathon (more) had the fastest win of the day, 2:08:56 by Samson Barmao (and 2:32:24 by Merkuria Aberume (ETH) in the women's race). Paul Kiprop and Mariska Duta took victories in the Brussels Marathon (more) and Half while in the far north of Scotland Tomas Abyu scored his third win in three visits to the Loch Ness Marathon (more) with a 2:20:50 clocking. 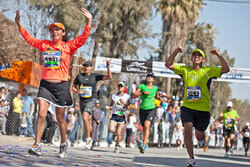 The 10km Marrakech (more) took place in Morocco and the Guayquil Marathon (more) was run in Ecuador's port city. Patrick Makau broke the world record in the 38th BMW Berlin Marathon (more), on 25 September, running the last 10km alone to record 2:03:38. He left the former world record holder, Haile Gebrselassie, behind him at 27km and held to a steady pace after the final pacemaker dropped back (and eventually finish second in 2:07:55). World Half Marathon Champion Florence Kiplagat won the women's race in 2:19:44. World record holder Paula Radcliffe, coming back a year after childbirth, kept her company for 12km but home favourite Irina Mikitenko overtook her at 33km and went on to take second place. Other marathons run on the day included the CamSur Marathon (more) in the Philippines, The Cape Town Marathon (more) in South Africa and the Lake Tahoe Marathon (more) in the USA. Elsewhere in Europe it was mostly half marathons, starting with the Maratonina di Udine (more) and the Turin Half Marathon (more) in Italy, and followed by the Dexia-Bil Route du Vin Half Marathon (more) in Luxembourg and the Half Marathon of Portugal Vodafone (more) across the Vasco da Gama Bridge in Lisbon. In the Netherlands the ABN AMRO Singelloop Utrecht 10km (more), where Leonard Komen set a world record last year, hosted another highly competitive field. Across the Atlantic another 10km race took place in the International 10km Costa Rica (more), San Jose. At the 2011 International Association of Athletics Federations (IAAF) World Championships in Daegu, South Korea, the IAAF Congress passed a motion to change the standard by which women athletes achieve world record performances in road races. By the new criterion, only times achieved in all-women competitions would be acknowledged for world record purposes, and performances achieved in mixed conditions would now be referred to only as “world best”. The new criterion means that Paula Radcliffe’s 2003 marathon mark of 2:15:25 is no longer the world record but now a world best, and that her 2005 London time of 2:17:42 is the world record. The boards of both World Marathon Majors (WMM) and Association of International Marathons (AIMS) have reviewed the recent Congress decision and believe that it does not represent what is required by the sport of road running. They further believe that there should be two world records for women’s road running performances, separately recognising those achieved in mixed competition and women’s only conditions. The vast majority of women’s road races throughout the World are held in mixed conditions. The current situation where the fastest time is not now recognised as a record is confusing and unfair and does not respect the history of our sport. WMM and AIMS congratulate the IAAF for introducing world road records and for continuing to support road running through its labeling scheme. AIMS represents more than 300 races worldwide, the vast majority of them road races. WMM members are Boston, London, Berlin, Chicago and New York. Both bodies are represented on the IAAF Road Running Commission and have leadership roles within road running. Performances considered for records, rankings and qualifying purposes must be achieved in accordance with IAAF Competition Rules. These include rules on course measurement, decrease in elevation between the start and finish, maximum distance between the start and finish lines. An application for a world record will only be considered if the athlete concerned undertook doping control at the event. Women's world road records - AIMS states its position. The DN Stockholm Half Marathon (more) took place on 17 September in which Isabellah Andersen scored a popular home victory and set a Swedish record. World Half Marathon record holder Zersenay Tadese was back in Portugal on his favoured ground on 18 September, where he has previously run the two fastest times ever recorded over the distance. Instead of Lisbon he was this time in the northern city of Porto, and ran 59:30 to win the Meia Maratona Sport Zone (more) by a margin of 99 seconds. Doris Changeywo won the women's race from local hero Dulce Felix by the smaller margin of 10 seconds, in 1:10:36. The day's programme had started with the Blackmore's Sydney Running Festival (more), including the Marathon, a Half Marathon, the 9km Bridge Run and the 4km Family Run. Action then moved to eastern and central Europe with the Moscow Peace Marathon in the Russian capital, the Varazdinski Half Marathon (more) in Zagreb, Croatia, the Wachau Marathon (more) along the banks of the Danube in Austria, and the inaugural Usti Half Marathon (more) in the Czech republic. Finally the Hans Christian Andersen Marathon (more) was run in Odense, Denmark and the Dam tot Damloop (more) from Amsterdam to Zandam where Leoard Komen set a new course record over the rarely-contested distance of 10 English miles. With Haile Gebrselassie and Paula Radcliffe (GBR) on the starting line of the BMW BERLIN MARATHON this is only the third time in history both marathon world record holders are in the same marathon. It happened in 1989 in New York City (Belayneh Dinsamo, Ingrid Kristiansen) and 2005 in London (Paul Tergat, Paula Radcliffe). Strongest competition for Paula Radcliffe in Berlin should come from the German Irina Mikitenko (2:19:19, Berlin 2008) and the European Champion Nayla Yulamanova (2:26:01, RUS) with Kenyan Florence Kiplagat also posing a potential threat, although the world cross country champion of 2009 and world half marathon champion of 2010 failed to finish her marathon debut in Boston last April. Also running is Lidia Simon (ROM) who wants to qualify for her fifth Olympic Games. On 10 September the Jungfrau Marathon (more), with a claim to be "the most beautiful marathon course in the world" was run up the Swiss Alp. In the evening the Mattoni Prague Grand Prix (more) took to the streets in the Czech capital with the Metro 10km race and the adidas 5km race for women. 11 September started with four marathons in the east of Europe: the Marathon of the Running Festival of the Economic Forum (more) and the Hasco-Lek Wroclaw Marathon (more) in Poland, the Vilnius Marathon (more) in Lithuania and the SEB Tallinn Marathon (more) in Estonia. The Bristol Half Marathon (more) was run in Great Britain, and the Media Maraton de Medellin (more) in Colombia. On 3 September the Ruskamarathon (more) was run in Finland and the Fjord Norway Half Marathon (more) was held in Knarvik, just to the north of Bergen. with two half marathons in Eastern Europe: Pila Half Marathon (more) in Poland and the 26th Nike Budapest Int'l Half Marathon (more) in Hungary. The Great Scottish Run (more) (another half marathon) took place in Glasgow and the Torshavn Marathon (more) was run in the Faroe Islands. The Medio Maraton Atlas de Guadalajara (more) was held in Mexico and the Kaua'i Marathon (more) in the Hawaiian islands finished off the action for the day. At the IAAF World Championships (more) in Daegu (KOR) on 27 August Kenyan women swept the Marathon, with Edna Kiplagat taking top honours in 2:28:43 ahead of Priscah Jeptoo (2:29:00) and Sharon Cherop (2:29:14). In another corner of the earth the seventh edition of the Ruta de las Iglesias (more) was held in Quito, capital of Ecuador. Six thousand runners took part in flaming torchlight, the 10km route taking them past the ornate facades of many of the city's colonial churches. On 28 August, five races are held on four continents. The Hokkaido Marathon (more) starts the action on the north island of Japan, followed by the Victoria Falls Marathon in Zimbabwe. In Ireland only one of two races originally scheduled, the Longford Marathon (more), takes place. The Galway Marathon was cancelled. Action then moves over to North America where the SSQ Quebec City Marathon (more) is run in Canada and the Marathon Int'l de la Ciudad de Mexico (more) in Mexico City. 26 August: Tata Consultancy Services (TCS) has become the title partner of the Amsterdam Marathon for the next five years. The first race under the new title, the 36th edition, will be held on 16 October. TCS is a leading IT services, consulting and business solutions firm. It has been operating in the Netherlands since 1992 and is one of its largest country operations worldwide. The City of Amsterdam welcomes the partnership for the future prospects of the Amsterdam Marathon and also for the enhancement of a possible Olympic Games bid for 2028 (100 years since Amsterdam previously hosted the VIII Olympiad). Action on 20 August lied in Scandinavia, with the Helsinki City Marathon (more) in Finland and the Reykjavik Marathon Islandsbanka (more) in Iceland. Continuing from where things left off the day before, on 21 August the Powerade Kobenhavn Half Marathon (more) was run through the Danish capital, before crossing to the Americas for the Rio de Janeiro International Half Marathon (more) and the Intact Insurance Canadian Derby Edmonton Marathon (more). During the impasse between the City Council and the organisers of the now-cancelled Galway City Marathon one of the most hurtful barbs thrown was the allegation by former mayor Michael Crowe that the organisers did not honour a commitment to donate marathon funds to sporting clubs and athletes in the city. Documentary evidence seen by the Advertiser and discussions held with various clubs and athletes has shown that many athletes, clubs and charities have benefitted from the generosity of the organisers Richard and Paul Donovan. The Donovans not only honoured the commitment to pass on a 2 euro capitation fee but paid a large multiple of the amount to Sports Partnership-registered clubs and athletes, donating more than €20,000. An additional €3,000 was given to GOAL charity, €3,000 to UltraRunning Ireland and €2,000 to Irish Schools Athletics. The donation to the Sports Partnership was not a prerequisite for last year’s Marathon. Richard Donovan said: “[Cllr Crowe] seems to want to take credit for the initiative. However, it was a voluntary undertaking by us and we simply informed the Council in advance. During the past week, people on the street were assuming we didn’t make a promised donation to a club or charity. Cllr Crowe decided to maliciously implant this falsehood in people’s minds." In a lengthy statement Cllr Crowe told The Advertiser that he withdraws the allegations that the funding commitment was not met. Galway City Marathon 2010 witnessed elite milers, marathon and ultra marathon athletes in the city, which resulted in the fastest road mile in Ireland in 2010, the second fastest marathon time (next to Dublin) and a World 50km Final championship best. Runner’s World, the biggest selling running magazine in the world, declared that the race could ultimately rival Dublin as Ireland’s marathon destination. Cllr Crowe says that many meetings were held regarding the Ironman event and that he did not show favouritism to one over another. For Declan Varley's full story in the Galway Advertiser, click here. 19 August: From 15 August to 23 December this year the AIMS Marathon-Museum of Running, Sportmuseum Berlin is running a photographic exhibition in the "Haus das Deutschen Sports" In Berlin's Olympiapark, open 10.00-14.00 Monday to Friday with free admission. At the 1936 Olympic Games in Berlin over 15,950 photos were taken at the over 335 athletic competitions. On a technical level, the sports photographers were in the midst of a transformative process in the mid 1930s, as they were increasingly moving away from the large-format cameras to the small-format cameras (Leica and Contax). But the only people who could receive accreditation to take photos at the Olympic sports venues were those belonging to the Imperial Commission of Photojournalists within the Imperial Association of the German Media – which meant that all foreign photojournalists were excluded. In addition, accredited photojournalists were divided into an athletic group, which meant those permitted to depict the actual sporting events, and a current events group, meaning those who were to capture the events going on outside of the actual athletic competitions. The athletic group received white armbands marked with their accreditation numbers, and the current events group received red armbands with their numbers. The clothing they wore was also prescribed (and provided). 114 photojournalists are listed by name and accreditation number but the official report names 125 photographers, of whom 69 were responsible for the athletic events and 56 for current events. To complicate things even more, all of the photojournalists received entrance tickets from the photo press office with a specific time and location where they were permitted to work. This rigid system of workspace specification naturally led to major disappointments. These working conditions were a strict consequence of the exploitive utilization of these Olympic Games, which Angermeyer described in his 1935 Hymn to Berlin: These Games provided us with an invaluable means of propaganda. Reichssportblatt No. 21, May 15, 1935 p. 583. This culminated in a photo adulteration, in which Adolf Hitler’s building enthusiasm was exaggerated. With the photo caption We’re ready to build! The classic photograph of a powerful head of state was staged - a Führer photo that was sent around the world, which even today is often reprinted in publications without comment or critique. Photos are often selected or ignored by text-oriented academics according to look or cost and come from the pool of photos that are available from the photo trading card albums, commemorative books, and special magazine editions from 1936. Rarely is much effort or money invested in searching the archives and museums for other unpublished materials, with the result that the current presentation of the 1936 Games is still filled with the photo aesthetics and selection that stemmed from Nazi times. In order to break through these barriers, the Berlin Sports Museum and the Forum for Sport history is presenting this selection of photos. The photo collection of the 1936 Berlin Games in the archives of the Sport Museum and Forum includes 1,179 photos (about 600 of them still unpublished) - from which this selection of 100 photos was made. 17 August: The Big Sur International Marathon has sold out in 29 days, the fastest ever for the 26-year-old race. A limited number of premium race registrations for specific programs will be made available throughout the coming weeks. These include the Runner's World Challenge, a VIP experience for the race; the JUST RUN youth fitness program charity bibs; the Boston2Big Sur Challenge, and additional charity bibs benefiting a variety of non-profit groups in the US and abroad. Other events held during the marathon weekend, including the marathon relay, 21, 10.6 and 9-Milers, and the 5K, remain open for registration. Fill rates for the various events are posted on the marathon's home page at www.bsim.org . The previous record of seven weeks for a Big Sur Marathon sellout was in 2002 following a designation of the Big Sur race as "The Best Marathon in North America" in the annual Ultimate Guide to Marathons. Two marathons will be held to mark the 20th anniversary of the Jungfrau Marathon in 2012. So twice the usual number of entries will be available. The World Long Distance Mountain Running Challenge will also take place within the framework of the Jungfrau Marathon. In terms of participant numbers, the Jungfrau Marathon is the biggest Swiss marathon and the world’s biggest mountain marathon. Entries have been snapped up very quickly in recent years and many runners lose out. But thanks to next year's anniversary, and the "double" event, 8,000 starting places will be on offer. The marathons will be held on Saturday, 8 September and Sunday 9 September. Entries for the 20th Jungfrau Marathon open on 9 September 2011. The World Mountain Running Association (WMRA) has awarded the World Long Distance Mountain Running Challenge to the Jungfrau Marathon for the second time (previously hosted in 2007). Women will battle it out for the World Championship title on 8 September, men on 9 September. The anniversary will be rounded off by a special fringe programme, for which the Jungfrau Marathon is teaming up with the Swiss Touring Theatre “Das Zelt”. Highlights will include the World Championship opening ceremony, award ceremonies, and shows by DJ Ötzi on Saturday and Sunday, as well as two special performances of the William Tell Open-Air Theatre. 9 August: On Women’s Day, the Comrades Marathon Association (CMA) pays tribute to the many women who have run the event and contributed to its spirit of camaraderie and grace for which it is known. Nearly a quarter of Comrades' entrants are women. This year alone saw 4,381 female entrants out of a total of 19,591. Until 1975, the world’s biggest ultra-marathon did not feature a single official woman runner. Only men were permitted to participate until the Golden Jubilee 50th running of the race when the Comrades Marathon was opened up to people of all races and significantly, also to women. Since then, year on year, the ultra-marathon has attracted a growing number of women athletes, who continue to add that indomitable sense of inclusivity, style and beauty to it. On 6 August Keiyo Kiplimo won the Siberian International Marathon (more) in Omsk, western Siberia with a time of 2:14:25. Next day, on 7 August Anderson Chirchir Kiprono won the the Maraton International de Asuncion (more) in Paraguay in 2:17:35 while Chemtai Rionotukei took the women's race in 2:53:10. 1 August: On 7 August one of the youngest members of AIMS holds their second edition - the Asuncion International Marathon, held in the capital of Paraguay. The race organization have a rare spirit of dedication led by race director Myrta Doldan who personally swayed local public authorities to lend their support and gained recognition from the national Government. Asuncion provides an attractive "out-back" course; flat and fast and run past historic buildings and along green avenues. This year Paraguay celebrates its bicentennial; 200 years since it became an independent state. It is an quixotic and exotic place, and the home to innumerable heroes who have battled to defend their national identity. Marathon runners next weekend will fight the same fight, as the Marathon is doing so much to define the place. On 30 July the Australian Outback Marathon (more) was run on the red earth roads around Ayers Rock in central Australia and the Swissalpine Marathon (more) took place in the ski resort town of Davos. On 31 July the Westlink 7 Cities Marathon (more) started the day in Australia, and action rounded off 18 time zones later with the Bogota Half Marathon (more) in Colombia and the San Francisco Marathon (more) on the California coast. The Yangmingshan cross country race, actually a half marathon run on the roads in Yangmingshan National Park, took place on 24 July. 19 July: Registration for the Big Sur International Marathon opened on 15 July and nearly half of the available marathon slots are already taken. Runners from all 50 states plus 15 countries have signed up to run the 27th Presentation on 29 April 2012. "We're on track to sell out in record time," said race director Wally Kastner. "Once we're full, the demand for held-aside charity spots will increase." At opening 3,735 entries were available, with additional blocked entries for Runner's World Challenge, Boston 2 Big Sur, and both national and international charity bibs. Six additional distance events take place over race weekend, raising overall registration figures to over 13,000. There are more women entered for the marathon than men, a higher than usual split between genders for the marathon distance. In the Rio de Janeiro Marathon (more) on 17 July a truly international field contested the title, with the men's race won by Patrick Ngoie (2:18:17), a French citizen transplanted from Kenya. In a rare international outing from North Korea, victory in the women's race went to Kim Ok Kum in 2:35:22. The times are not fast, but the course is not the easiest, and conditions in Rio are never easy, so the unknown Ms. Kum should likely break 2:30 in more conducive circumstances. On 9 July the Zermatt Marathon (more) celebrated its 10th edition in the Swiss Alpine resort. On 10 July the Correcaminos Half Marathon and 10km (more) took place in Costa Rica, and the Maraton de Quito (more) in the Ecuadorean capital. 08 July: Lornah Kiplagat will take part in the Amsterdam Marathon on 16 October to try to qualify for the Olympic Games in London. Kiplagat won the Amsterdam Marathon in 1999. Kiplagat's aim in Amsterdam Marathon will be to run a time of 2:27:24 or better. In London earlier this year she recorded 2:27:57, but rated it a personal success because "the feeling is back" after a long period of injuries. The Amsterdam course offers her the opportunity to run a fast time. If she gets there London 2012 Games will be her third, after representing the Netherlands at 10,000m in 2004 and 2008, finishing fifth and eighth respectively. The top Dutch runner is known mostly for her achievements on the road. She has won World titles four times: at 20km in 2006; at the half marathon in 2007 and 2008; and in cross country in 2007. Apart from Amsterdam Kiplagat has won Rotterdam and Osaka, and twice won the Los Angeles Marathon twice. Her personal best marathon time is 2:22:22 from Osaka in 2003. Entries for the Amsterdam Marathon, coming from more than 75 countries, are 20% up compared to this time last year, indicating that it could soon become one of the biggest marathons in Europe. In the Gold Coast Airport Marathon (more) on 3 July Nicholas Manza won in 2:10:01, breaking the 22-year old course record by 10 seconds. Goitetom Tesema won the women's race in 2:30:08. 30 June: A significant new addition to the collection of the AIMS Marathon Museum of Running (filling 34 running metres of shelving and weighing about 900kg) arrived in Berlin from Atlanta, Georgia. The Honorary AIMS Statistician Dr David Martin has been donating items to the Museum with every visit since 2008. Now he has given the major part of his athletics/marathon library which forms the “David E. Martin Collection”. This recent donation amounted to approximately 800 books, 60% bound magazines and 40% yearbooks on running, international athletics, and numerous publications about running. The Atlanta Track Club generously took an inventory of the books and packed them for shipment. Shipping and customs formalities delayed the transfer process but the Museum received the material on 9 May and since the beginning of June it has been is on exhibit in the “Gerhard Schlegel Room”. Many of the magazines that can now be viewed in the Berlin Sports Museum are not available anywhere else in Europe. 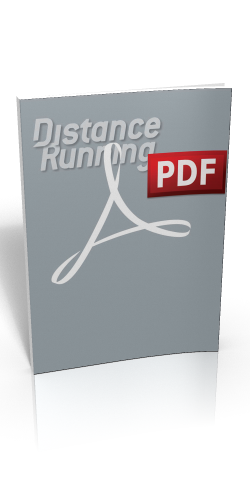 Some of the magazine titles do not show up in the international electronic catalogues, including: Boston Running News, Marathon and Beyond, New England Runner, New York Runner, New York Running News, AIMS-Newsletter, NRDC News, Track & Field News, Track Technique and the ATFS Annual. Gerd Steins, responsible for receiving and curating the consignment in Berlin commented: "It is not only historians and museum people who know how hard it is to separate yourself from the things you have collected in your life. In the name of the Berlin Sports Museum - AIMS Marathon Museum of Running I would like to express a heartfelt thank you to David Martin for his generous donation. On 25 June the Vidovdan 10km (more) took place in the Bosnian town of Brcko. The 15th edition opened not with the traditional children's races, but with a babies' race. About 40 babies crawled 5m to reach the finish line. Then the children's races started featuring an honourary competitor who was not a child — AIMS President Paco Borao. Although he did not win, he did present the medal to the winner. Near to the top of the world the Midnight Sun Marathon (more) started at 20.30, so that most runners finished in daylight, after midnight. The Lake Saroma 100km started the programme on 26 June, followed by the Standard Chartered KL Marathon (more). The only AIMS event to be held in Europe was the Ergo White Nights Marathon (more) in St Petersburg, but the Tanagamanga Marathon (more) took place in Mexico and the Scotiabank Vancouver Half Marathon (more) completed action for the day. Marathon world record holder Paula Radcliffe of Great Britain is the top female entry at the BMW BERLIN MARATHON on 25 September. With her and Haile Gebrselassie on the starting line, both marathon world record holders are competing in the same race – a first on German soil. Thirty-seven year old Radcliffe set her mark of 2:15:25 in the 2003 London Marathon. The BMW BERLIN MARATHON will be her first marathon after giving birth to her second child in September 2010. Her foremost goal in Berlin is to qualify for the Olympic marathon 2012 in London. The fast course in the German capital is the major reason for Radcliffe to run here. Seven world records were clocked in Berlin (four on the men's side and three on the women's). Haile Gebrselassie set two of them, 2:04:26 in 2007 and 2:03:59 in 2008 on his way to winning this race four times in a row (2006-2009). On 18 June the Santa Claus Marathon (more) was held in the Northern Finnish town of Rovaniemi, while the Olomouc Half Marathon (more) was run in the Czech Republic, and the Portumna Marathon (more) was staged in a beautiful woodland setting in Ireland. On 19 June the Marathon de l'Ile Maurice (more) took place on the scenic Indian Ocean island, while the Sao Paulo International Marathon (more) was run through South America's biggest city. 18 June: With the BMW BERLIN MARATHON 100 days away, race director Mark Milde announced the return of marathon world record holder Haile Gebrselassie to the streets of Berlin. Here the Ethiopian superstar of long distance running had his greatest success as a marathon runner winning four times in a row between 2006 and 2009 clocking the world marathon record twice (2007 and 2008). His record time of 2:03:59 hrs still stands today as the mark to beat. “I love the Berlin Marathon. The crowds are fantastic and on a good day everything is possible on this extremely fast course,” he said. In the women's race Irina Mikitenko is back again on the course where her marathon career had started in 2007. In the following year she clocked 2:19:19 there for a course record, making her the fourth fastest woman of all time. In 2010 she was handicapped by an injury, but in April this year she ran 2:24:41 for seventh place in London after running most of the distance on her own. In Berlin she also wants to qualify for the Olympic Marathon in London. The BMW BERLIN MARATHON sold out in February, after registration had started on 18 October. The participation limit is set at 40.000. Entries for the Inline Skating Marathon on Saturday, September 25th are still available. Accreditation is possible starting August 1st (until September 9th). The BMW BERLIN MARATHON will be televised live on n-tv nationally for four hours and on Eurosport from 09.00 until 11.30. Russia's Vsevolod Khudyakov and Finland's Mari Kauri triumphed in the tropical heat of the Laguna Phuket International Marathon (more) on 12 June, winning in 2:33:51 and 3:20:46 respectively. ALCAR (Asociacion LatinoAmericana de Carreras de Ruta) held their Congress on Thursday 2 and Friday 3 June, attended by AIMS President Paco Borao, Board Member Fernando Jamarne from Chile, and Race Directors from Costa Rica, Venezuela, Columbia, Peru, and Paraguay, as well as host Ecuador. Festivities continued on Friday evening with the lighting of the Marathon Flame, brought from Greece by SEGAS, in the spectacular Plaza de San Francisco. The two-hour ceremony included traditional Ecuadorian music and dancing. On 4 June Mamitu Daska won the Friehofer's 5K Run for Women (more) in Albany, New York in 15:19, beating last year's winner and course record holder Emily Chebet into third place. In the Tata Consultancy Services World 10K Bangalore (more) on 5 June Philemon Limo front ran to victory in 28:01, but a slow early pace in the women's race led to a frantic sprint finish, won by Dire Tune in 33:19, with Merima Mohamed given the same time. On the same day the Zelenograd Half Marathon (more) was run in a town just outside Moscow and in South America the Quito Las Ultimas 15km (more) was won by and Constantino Leon in 46:25 and Diana Landi in 52:23. On 6 June the Cork City Marathon (more) was held in the west of Ireland. On 29 May the Cayirova Run 10km (more) took place in Turkey for the second time. The Kigali Peace Marathon (more) was run in Rwanda, while in South Africa the 86th Comrades Marathon (more) was run on the 89km "up" course from Durban to Pietermaritzburg. Stephen Muzhingi recorded his third straight win and Elena Nugalieva again beat her twin sister into second place for the women's title. Like Muzhingi they have won for the last three years, but Olesya narrowly beat Elena in 2009. Over in Canada two races were held which between them celebrate 84 editions: the Ottawa Marathon (more) ran its 37th event, while further west the Scotiabank Calgary Marathon (more) clocked up its 47th running. Body Fuel: what really works? On 21 May the Great Wall Marathon (more) was held in China, with Yangqiao Yun (CHN) and Mari Kauri (FIN) triumphing in 3:18:38 and 4:11:19 over a course which included steep and irregular 5164 steps. In Europe the Terwamarathon (more) took place in Oulu, Finland, won by Teppo Rontainen in 2:35:59 and Anne Makela in 3:09:57. In the Goteborg Half Marathon (more) in Sweden Albert Matebor and Joyce Chepkirui recorded winning times of 1:00:52 and 1:09:04. The Three Hearts Marathon (more) was run in Slovenia. On 22 May five marathons were run in Europe: the Luzhniki Moscow Marathon (more), the Nordea Riga Marathon (more), the Nykredit Copenhagen Marathon (more), the Haspa Marathon Hamburg (more) and the Edinburgh Marathon (more). There is also one half marathon - the Douro Valley Half Marathon (more), run through breathtaking scenery in Portugal's wine country. 20 May: Patrick Makau Musyoki has been awarded one of the most highly coveted accolades in distance running, the AIMS/ASICS Athlete of the Year Award. This is the first time Patrick has won the award and his success follows on from that of his compatriot, last year’s winner, the late Sammy Wanjiru. Gothenburg Half Marathon Race Director Bo Edsberger presented the AIMS/ASICS Golden Shoe at a short ceremony prior to the Gothenburg Half Marathon on 21 May. Makau joins fellow Kenyans Benson Masya, Paul Tergat, Josephat Kiprono & Sammy Wanjiru as winners of the award. Patrick had an outstanding year last year winning the 36th edition of the City-Pier-City Half Marathon in The Hague with a time of 59:52. After this he significantly improved his marathon best to 2:04:48 to win the Rotterdam Marathon, and become the fourth fastest Marathon runner ever. He followed up this achievement by winning the Berlin Marathon in 2:05:08. The AIMS/ASICS Athlete of the Year Awards were founded in 1992 and are made each year through nominations from AIMS member races, which total over 300 races in more than 90 countries. 20 May: The 2011 Comrades Marathon is set to boost the KwaZulu-Natal economy by almost R300 million over the next few weeks, according to general manager, Gary Boshoff. Boshoff was announcing the results of a comprehensive economic impact study which was conducted as part of the 85th anniversary of the Comrades Marathon in 2010. Repucom International used a team of researchers who interviewed hundreds of local and international participants, supporters, sponsors, officials and members of the general public to determine the real economic impact the Comrades Marathon has on the province of KwaZulu-Natal. The detailed study incorporated the direct spend of the Comrades Marathon Association as well as the various sponsors and partners that annually invest millions into the world’s biggest ultra-marathon. According to Etienne Karsten, Vice-President of Repucom SA, the results confirm the Comrades Marathon as the biggest road race in South Africa and validates its recent inclusion into the Guinness Book of World Records as the biggest ultra-marathon in the world. “The 2010 economic impact study of the Comrades Marathon revealed that R286 Million was pumped into the KZN economy as a direct result of the Comrades Marathon being staged in KwaZulu-Natal. It therefore makes perfect economic and political sense for business and government to continue to support the event”, he said. Gary Boshoff stressed the importance of the Comrades Marathon for the tourism industry in particular. “Local participants (South Africans from outside KZN) stayed an average of 5 days while international participants tend to stay longer, on average 8.3 days in 2010. 70% of participants come from outside KwaZulu-Natal." The CMA is working very closely with the cities of Pietermaritzburg and Durban, as well as Tourism KwaZulu-Natal to ensure that the Comrades Marathon remains one of the world’s prime sports events. “In recent years we’ve stepped up our international marketing drive through the assistance of Tourism KwaZulu-Natal in particular" sadi Boshoff. "On behalf of the CMA I want to publicly express our appreciation to them. The number of international entrants has more than doubled over the last three years: from 604 in 2009 to 1226 in 2011. This year we have runners coming from 59 countries." 18 May: On the occasion of the 31st BIG 25 Berlin race, AIMS presented a special award to honour the race organisers and the winners of the previous year's race in which world records were set in both male and female races. This was the first time this has ever happened. Samuel Kosgei and Mary Keitany, both from Kenya, both broke the world 25km records. Kosgei (1:11:50) took 55 seconds from the mark held by Paul Kosgei since 2004. Keitany smashed the 1:20 barrier, improving Mizuko Noguchi's time (1:22:13, set en route to a Berlin Marathon finish in 2005) to 1:19:53. In last year’s race, 24 year-old Kosgei opened a decisive gap in the final 2km before going on to claim first place. Altogether seven runners finished inside 1:14, among them the former record holder Paul Kosgei, who had been in the leading group until 15km. In the women’s event Mary Keitany ran her own race at the front from the start. She passed 10km in 31:58 and clocked 47:58 at 15km. Even when the course climbed back up towards the Olympic Stadium she kept her rhythm and speed to finish almost five minutes ahead of closest competitor Alice Timbilili. After the race Keitany said: "I prepared long and hard for this race and I expected to break the record…but not by such a big margin, or to run sub-1:20. ", Keitany also capped off an outstanding 2010 by claiming AIMS’ annual AIMS/ASICS World Athlete of the Year Award. BIG 25 Berlin Race Organiser Gerhard Janetzky comments: “I thank AIMS for the presentation of this special award. We are happy to share in the delight of Samuel Kosgei and Mary Keitany for their achievements. This year we saw another great race with world-class times and a total of 10,423 entries registered. It was a bit too warm for a world record but our record number of spectators enjoyed the event.” In this year’s event Mathew Kisorio (Kenya) clocked 1:12:13, the third fastest time ever run at the distance, missing the world record by just 23 seconds. Women's winner Filomena Chepchirchir clocked 1:23:22, the fastest time so far in 2011. 17 May: After his 1930 win in the Comrades Marathon Wally Hayward commented “If I have to run this hard to win this race, I’ll never run it again.” His comment was prompted by 18 year old Carbineer, Phil Masterton - Smith who finished less than 200m behind the great Hayward. The following year Masterson-Smith became the youngest ever Comrades winner. So long as the current age rules remain, this record will never be broken. This year's race on 29 May marks the 80th anniversary of that win. He finished 6th in 1932 and 10th in his last run in 1933. That year he rode his bicycle from Cape Town to the start because he could not afford the train fare. Bikes of that era were primitive and the roads and passes were not as they are now. His 10th place was achieved in a few seconds over 8 hours. This year four young Carbineer Athletes, John McInroy, Paul Blake and the van Zyl brothers, Lourens and Wynand (“WP” to his friends and the only one with a Comrades finish to his credit), will be setting off from Cape Town, on the 19th May, to emulate Masterton-Smith’s epic journey in 1933. These Carbineers will complete a total distance of over 1820kms in the ten-day period (1722kms cycling and 89.1kms running) all in aid of Breast Cancer and the Sports Trust. 16 May: AIMS is shocked to learn of the sudden and tragic death of Kenyan Olympic Marathon Champion Sammy Wanjiru at his home this morning, aged 24. Wanjiru was one of the most talented long distance runners of his generation and will be most remembered for his victory at the 2008 Beijing Olympic Games where he became Kenya’s first Olympic champion in the Marathon. Recording a time of 2:06:32 in baking hot conditions, he broke the Olympic record by nearly three minutes. Only 21 at the time, Wanjiru became the youngest Olympic Marathon champion since 1932. Wanjiru rose to prominence on the world stage in March 2007 when he broke the Half Marathon World Record, running 58:33 at The Hague. His attentions then quickly turned towards the Marathon where he made an immediate impact. In December 2007 he won the Fukuoka Marathon in 2:06:39 before smashing his personal best the following year, four months before the Olympics, to finish second in the 2008 London Marathon in 2:05:24. In 2009 he further improved on his performances to take first place in London clocking 2:05:10, a then course record, before capping off a memorable year by taking the first of his two Chicago Marathon crowns in 2:05:41, a course record which still stands. He defended his title last October clocking 2:06:24 in a performance which would be his last. In recognition of his great achievements, Sammy was a recipient of both the AIMS/Citizen World’s Fastest Time Award for his world record performance in The Hague and was named AIMS/ASICS World Athlete of the Year by his peers in 2009. Both awards are on exhibit in the AIMS Marathon Museum of Running in Berlin, Germany, which will stand as a lasting legacy of his fine career. The Bozcaada Half Marathon and 10km (more) took place in Turkey on 14 May. On 15 May the iWelt Wuerzburg Marathon (more) was run through the scenic German town. Across the Atlantic the Goodlife Fitness Toronto Marathon (more) moved to its new late-spring date. Further south the Panama International Half Marathon (more) and the Lima 42K (more) completed the day's programme. Six AIMS races were held on 8 May, all in Europe. The Skopje Marathon (more) took place in the Macedonian capital, incorporating the Balkan Marathon Championships and attracting a record field of 3000 entrants. The Maratona d'Europa (more) followed, in the Italian city of Trieste, won by local runner Giacomo Porro in 2:32:21 and Eva Vignandel in 3:09:49. In the Volkswagen Prague International Marathon (more) Lydia Cheromei broke her own personal best and shattered the course record by three minutes, running 2:22:34. Benson Barus won the men's race in 2:07:07 and led home two compatriots under 2:08. Further north, the Big 25 Berlin (more) was won by Mathew Kisorio in 1:12:13 and Filomena Chepchirchir in 1:23:22. Elsewhere in Germany Nahashon Kimaiyo and Merima Mohammed triumphed in the METRO Group Marathon Düsseldorf (more) running 2:10:53 and 2:28:14. In the Maraton Martin Fiz (more), held in the Basque city of Vitoria, James Moiben ran one second slower than Mohammed had in Düsseldorf to win the men's race in 2:28:15 while Gemma Perez Berasategui took the women's race in 3:08:58. From the BBC News website: The Gaza Strip has held its first-ever marathon, with the course running the full length of the small coastal territory. Nine runners went the full distance, with more than 1,000 schoolchildren forming relay teams and joining in for shorter stretches. Palestinian runner Nader el Masri, who hopes to qualify for the London 2012 Olympics, finished first in 2:42:47. He is one of 26 aspiring Olympians being tracked by the BBC's World Olympic Dreams project in the run up to London 2012. The marathon raised $1m (£600,000) for a summer camp for Gaza children. It was the idea of Australian Gemma Connell, who works for the UN Relief and Works Agency (UNRWA). which helps Palestinian refugees. She was one of two foreigners and seven Gazans who ran the full marathon, between Beit Hanoun in the north of the territory to Rafah on the border with Egypt. "You have the London Marathon, the Sydney Marathon, the New York Marathon and now the Gaza Marathon," said UNRWA spokesman Chris Gunness. "It just shows that Gaza could be a normal place if it got the chance." 05 May: The 26th Venicemarathon, due to take place on 23 October, has almost reached the participant cap. The 6,000 regular bib numbers have been sold out and the organizing committee have decided to close all possible ways to register directly except for the Tour Operators working in different countries. About 760 special bib numbers are still available, dedicated to support three social projects, and they can be purchased only online. The runners who will be able to get one of those numbers can choose to run to support the digging of new water wells in Uganda with the project Run for Water, Run for Life; running to support the building of prosthesis for children with the project Bimbingamba or running to subsidize the immunization campaign of polio in the underdeveloped countries supported by Rotary International thanks to the Project Run to End Polio. On the website www.venicemarathon.it all detailed information on each project can be found and a special counter will update the bib-numbers available to runners. Mayday, Mayday! On 1 May the Big Sur International Marathon (more) ran their 26th presentation on a course rescued from the clutches of the Pacific. A landslip on the scenic coastal Route 101 required hasty replanning, but a reconfigured course is in place. A few hundred miles to the north, and over the 49th parallel, the BMO Vancouver Marathon (more) celebrated their 40th edition. On 3 May the Silesia Marathon (more) was held in Poland. 2 May: The Nagoya International Women's Marathon was cancelled when the earthquake and tsunami hit Japan just a few days before the event was scheduled writes Ken Nakamura. It was to be the last of the elite-only editions of the race, and next year's race, to be held on 11 March 2012, will be an all-women's marathon with 15000 runners. It will be part of "Marathon Festival Nagoya Aichi," which also features half marathon and 10km races for both men and women - only marathon is women-only. 30 April: Boston winners Geoffrey Mutai and Caroline Kilel, along with London Marathon winner, world leader, and world record holder for the Half Marathon Mary Keitany are all nominees for the United States Sports Academy's Female and Male Athlete of the Month award for April 2011. The Academy's online ballot can be found at www.ussa.edu. Each month the United States Sports Academy selects a Female and Male Athlete of the Month and encourages people to vote for them when the live online voting starts on Tuesday 3 May 2011. Voting runs for runs one week until Tuesday 10 May 2011. Should Kilel, Keitany or Mutai win the most votes, they will be considered as a candidate for the 2011 Athlete of the Year ballot. In December 2011, the Academy will name the Male and Female Athlete of the Year for the 27th consecutive year. The recipients of this prestigious award are selected annually through worldwide balloting hosted by the Academy in conjunction with USA Today and NBC Sports. In 2010, the Male Athlete of the Year was Spain’s star football (soccer) player David Villa and the Female Athlete of the Year was South Korea’s figure skater Yuna Kim. Athlete of the Month winners will be announced on the Academy’s website an in the online edition of The Sport Update during the second week of every month. 26 April: In the 6th Laguna Phuket International Marathon on 12 June six contestants of The Biggest Loser Asia will take part. The six-strong team of TV reality show contestants - with a combined weight loss of 314kg, equivalent to the weight of a baby elephant – will put their new fitness lifestyles to the test in the Marathon. The line-up reunites the top three Season 2 contestants: winner Raj Devaraj of Singapore who shed 67kg; runner-up Atikom Laksanapanai (Nai) from Bangkok w ho lost 63 kg; and third-placed Genghis Enrique of the Philippines who lost 57kg, in a new battle for top honours. Also on the team from Series 2 are Indonesian-based American Scott Hanna who lost 56kg and Picharatch Phuntawornawin (Peachy) of Bangkok who lost 26kg. Phuket-based TBLA Season 1 contestant Garry Holden, who transformed his life on the show with a 45kg weight loss and went on to successfully complete the Laguna Phuket half marathon in 2010 brought the five to his home town. Holden has since gone on to complete the Laguna Phuket Triathlon in November 2010 and Ironman 70.3 Asia-Pacific Championship in December 2010. He will attempt the full marathon in this year’s Laguna Phuket International Marathon and lead the team on their individual challenges. Five out of the six will take on the full distance. “Each one is an inspiration and this event will be a fantastic experience for them as they develop their new fitness lifestyles,” said Holden. The Old Mutual Two Oceans Marathon (more) (56km) held in Cape Town on Easter Saturday, 23 April resulted in a home win for George Ntshiliza in 3:08:31, less than 100m clear of Motolhokoa Nkhabutlane of Lesotho, with three others finishing under 3:10. In the women's race the Nurgalieva twins again dominated, with Olesya winning in 3:33:58, nearly four minutes clear of Elena and a further four minutes clear of Lesotho's Mamorallo Tjoka. 19 April: Norwegian icon and pioneer of women's Marathon running, Grete Waitz, passed away on 19 April. Grete Waitz had a long and successful career on the track (recording two world records at 3000m) and in cross country before turning to the Marathon in 1978. She ran the New York City Marathon and posted a world best time in her debut of 2:32:30, lowering it to 2:27:33 in the same race the following year, and to 2:25:41 in 1980. She won New York again in 1982 and 1983, in the same year briefly recapturing the world record in the London Marathon in 2:25:29 and winning the inaugural World Championships in Athletics women's Marathon in Helsinki. In 1984 she finished second in the Inaugural Women's Olympic Marathon in Los Angeles. She won nine times in New York and twice in London. She dropped out of the 1988 Olympic Marathon in the later stages, and although later retired from competition continued to participate in events, encouraging fitness awareness and and charitable causes. She ran the 1992 New York City Marathon with race founder Fred Lebow, after he was diagnosed with brain cancer. In 2005 she was herself diagnosed with cancer, and in 2007 set up a cancer care foundation funded through an agreement with adidas to direct a percentage of sales receipts from their Grete Waitz and Modern Classics collections. She died of cancer on 19 April 2011, aged 57. The BAA Boston Marathon (more) on 18 April produced the two fastest marathons ever run. Geoffrey Mutai won in 2:03:02 and Moses Mosop chased him home in 2:03:06. Such fast times, however, cannot be recognised as records because the Boston course drops more (3.2m/km) than the allowable amount (1m/km) and has a start separated by the finish by 91% of the race distance, allowing runners to benefit from any tailwind - and there was a strong one behind Mutai and Mosop. 17 April was one of the busiest race days of the year. The Nagano Olympic Commemorative Marathon started the day and nine European events follow. Only one, the Semi Marathon International de Nice (more), was a half marathon, with eight Marathons covering most of the continent: the Cracovia Marathon (more) in Poland, the Belgrade Marathon (more) in Serbia, the Sant Antonio Marathon (more) in Italy, the Vienna Marathon (more) in Austria, the Zurich Marathon (more) in Switzerland, the DVV Antwerp Marathon (more) in Belgium, the Enschede Marathon (more) in Netherlands and the Maraton Popular de Madrid (more) in Spain. The Vancouver Sun Run 10km (more) was run in North America. The Pardubice Wine Half Marathon (more) was held on 16 April. 18 April: The collapse of California's scenic Highway One, midway along the Big Sur International Marathon course, prompted a new routing for the race on 1 May. After several weeks of meetings, surveying and discussions, the modified course has been finalized. Normally a point-to-point run from Big Sur to Carmel, this year's race is on an "out and back" course along Highway One beginning on the Carmel River Bridge near Rio Road, Carmel. The 4500 registered marathoners, along with 300 marathon team relay participants will head off at 06.45 and eventually be narrowed into the inland lane of Highway One. Immediately following will be the 21 and 9 mile events. The 10.6 miles will have already begun at 06.30 with runners and walkers headed north on the ocean side lane of Highway One from their traditional start at Rocky Point Restaurant. The 5km event begins at 07.45. "There are many moving parts on race day," said race director Wally Kastner. "We've had to adjust routes, times, and transportation to make this event come together in a very short time. The compacted course will now cover 12.1 miles of road with runners headed in two directions along Highway One. The marathoners will turn around just north of the Rocky Creek Bridge, approximately a half mile north of the collapsed road, and return on the ocean side lane, sharing space with the 21 and 10.6 Mile runners and walkers as in previous years. The new course offers exceptional views of the California coastline, showcasing verdant hills, spring wildflowers, rocky shoreline and crashing surf. In order to make the full 26.2 mile distance, marathoners and last leg relay runners will also be routed into Pt. Lobos State Reserve, the jewel of the California State Parks, offering a new addition to the course for this year only. This year's modified course was certified by a USATF certifier on 10 April and is rated as a Boston qualifying race. A similar road collapse occurred in 1998 near Hurricane Point, just south of Bixby Bridge. Both Hurricane Point and Bixby Bridge are icons of the annual Big Sur International Marathon, but will not be seen in this year's race. Though initial response from runners indicated disappointment, the majority of the entrants are positive, upbeat and excited about the "new and different" course. Of the 4500 registered marathon participants approximately 75% are first-timers. In the North Pole Marathon (more) on 8 April, runners ran through the polar night (in daylight) all of them finishing despite temperatures of -32C. On 8 April the Dead Sea Ultramarathon (more) took place in Jordan, and the Tel Aviv Gillette Marathon (more) in Israel. The Daegu International Marathon (more), precursor to the World Championships that will be held there in August, started proceedings on 10 April. In Europe the Alexander the Great Marathon (more) in Thessaloniki was followed by three major spectacles: the Milano City Marathon (more), the Paris Marathon (more) and the ABM AMRO Rotterdam Marathon (more). In Paris Priscah Jeptoo ran the second fastest time of the year (2:22:55) while in Rotterdam Wilson Chebet (2:05:27) and Vincent Kipruto (2:05:33) ran the two fastest times of the year. In Milan very hot conditions - up to 27C - resulted in modest winning times of 2:10:38 by Solomon Bushendich and 2:41:24 by Marcella Mancini. With the cancellation of the Gaborone City Marathon in Botswana the only other event of the day was the Sao Paulo Half Marathon Corpore (more) in Brazil, won by Fabio Nacimento in 1:08:01 and Elisabeth Esteves de Souza in 1:21:06. A group of strong Kenyan runners have been signed for the 28th edition of the Vienna City Marathon on 17th April. Among them is the 2004 IAAF World Half Marathon Champion Paul Kirui. While the Kenyans are expected to target the 2:07:38 course record they will also be pursued through the Austrian capital by Haile Gebrselassie, who will be competing in the half marathon. The elite marathon runners will get a head start and it will be Haile’s aim to catch them before he finishes his half marathon. The time difference at the start has yet to be determined. More than 30,000 runners have already entered the various events of the Vienna City Marathon. Online entry is still available at: www.vienna-marathon.com. With a personal best of 2:06:44 Paul Kirui is one of the fastest runners ever entered into the Vienna City Marathon. 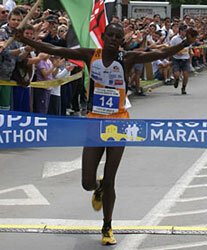 The 31 year-old Kenyan had clocked this time back in 2006, when he was second at the Rotterdam Marathon. But every year since he has since not run slower than 2:08:23. Last March he was third in the Seoul Marathon with 2:07:35. On 3 April two 18-year old Kenyans took the Vattenfall Berlin Half Marathon (more) by storm, with wins from World Junior Cross Champion Geoffrey Kipsang in 1:00:38 and Valentine Kipketer in 1:10:12. In the Poznan Half Marathon (more) Dennis Musau and Eunice Kales took top spots with 1:03:14 and 1:12:54. Enoch Mitei won the Medio Maraton de Madrid (more) in 1:02:42 and Firhiwot Goshu won the women's race in 1:13:25. The Semi Marathon Int'l de Rabat (more) was also run, with the single AIMS member race at the full distance being the mds Santiago Marathon (more) in Chile. 31 March: The 86th Comrades Marathon to be run on 29 May 2011 on the "up" course from Durban to Pietermaritzburg has attracted 19617 confirmed entries - 78% men and 22% women. Foreign participation has increased, with largest contingents coming from UK (253), USA (179), Australia (152) and Brazil (115). There will be 4882 'novices' doing Comrades for the first time. Big news at the elite end is that for the first time an Ethiopian team has entered and will pose a formidable threat to last years' winners. All top-10 finishers in both the men’s and women’s races last year will line up again this year. The women’s race will once again see the dominant Nurgalieva twins Elena and Olesya battle it out for top position. On 25 March the Jerusalem Marathon (more) was held for the first time, having succeeded the Half Marathon held for the last few years. On 27 March the Incheon Half Marathon took place in Korea, followed in Europe by the Novi Sad Half Marathon (more), the Bratislava Marathon (more) in the Slovakian capital and the Treviso Marathon (more) and the Ferrara Marathon (more) in the north of Italy. On the other side of the Atlantic the Punta Cana Half Marathon (more) was held in the Dominican Republic and the Costa Rica Marathon (more) inaugurated the new stadium in San Jose. The organisers of the Gaborone City Marathon regret to announce the cancellation of the race, which was scheduled for 10 April. Five weeks before the race Gaborone City Marathon (GCM) was suddenly presented with a 50% cut in the budget and the prospect of possible further cuts. There was no certainty, as the major funding body, a government parastatal, suddenly announced these cuts and was unable to guarantee any of the funding at all. Botswana, like many countries, has been badly affected by the general economic meltdown and all government departments have been subjected to substantial budgetary cuts. As a result, race t-shirts, goodie bags, professional fees and other critical aspects for staging the event were no longer covered. Gaborone City Marathon sought to secure alternative funding and did receive an expression of interest from an international organisation. However, the time for signing an agreement was too short and could only apply for 2012. On this basis, the organisers felt strongly that to continue incurring expenses without the required funding would be irresponsible. GCM informed all its sponsors, entrants and suppliers and held a press conference on 10 March. Virtually all race partners agreed that cancellation was the only realistic option. GCM has entered discussions with a potential partner for 2012 and hope to finalise arrangements in the next few months. Two weeks have passed since the terrible earthquake and tsunami in Japan. The whole country is experiencing a very difficult moment and sadness is still the prevailing mood throughout Japan. Messages of solidarity and encouragement from AIMS and the running community have been warmly received, and an enquiry has been received seeking certain information. As far as known, there is only one running event which has been organised as a direct result of a natural disaster, with the purpose of encouraging the spirit of the people who suffered as a result of it. This is the "Bay to Breakers" run in San Francisco, which celebrates its centenary race this year. Information is sought about any other such running events in the world which have been set up to revitalize people in the area after a natural disaster. This information might be helpful for a quicker recovery in Japan. Please share any knowledge you have of such running events by replying to aimssec@aol.com. At 05.13 on 18 April 1906 a devastating earthquake rocked San Francisco. The subsequent fire and destruction left many fearing that the City would never fully recover. But San Franciscans, displaying their typical fortitude, immediately began rebuilding the city and orchestrating events to lift civic morale. One of those events, the Cross City Race - better known today as the Bay to Breakers - was first held on 1 January 1912. It was intended as a precursor to the world-class athletic events being planned for the 1915 Pan-Pacific International Exposition. 122 participants ran in 1912, and Robert Jackson "Bobby" Vlught, a St. Mary's College student, was the first runner to cross the finish line, with a time of 44:10. Since then, Bay to Breakers has prevailed as a testament to San Francisco's uniqueness and audacity. Each year the race is a glorious celebration of the human spirit - a giant wave of athleticism, fun, frivolity, and determination flowing across the City from the Bay to the Pacific Ocean. Bay to Breakers is one of the largest footraces in the world with 50,000 + participants and 100,000 + spectators annually. As the race grew in size it set a Guinness Book record, with 110,000 participants in 1986. The course is challenging and beautiful, and consistently attracts world class competitors - but it isn't just a race for the elite. In the true spirit of San Francisco the race is a celebration for everyone. Thousands of costumed participants join with families, and weekend runners and walkers. As they make their way through the heart of San Francisco, energized by continuous bursts of live music, they are cheered on by thousands of spectators lining the route. Throughout its long history Bay to Breakers has been a showcase for the City's irrepressible color and its affection for eclectic traditions. Although runners come from across the country and around the globe, the race is still a quintessential San Francisco experience and a true reflection of life between the breakers and the Bay. World Championships marathon team qualifying race. Yuri Kano (see note below), Yurika Nakamura, Mizuho Nasukawa, Azusa Nojiri and Yukari Sahaku have indicated that they will run London, while Hiromi Ominami said she will run Boston. Yuko Machida will run Daegu. The World Championships marathon team (all the men's and part of women's team (Yoshimi Ozaki has qualified automatically in Yokohama on 27 Feb) will be announced on 31 March. 24 March: Yuri Kano's coach has indicated that she has withdrawn from the London Marathon. In the Meia Maratona de Lisboa (more) on 20 March Zersenay Tadese ran the second fastest ever Half Marathon, just seven seconds slower than his own world record that he set in the same race last year. Aberu Kebede won the women's race in 1:08:28. The Seoul International Marathon (more) was held earlier in the day, and the Maratona di Roma (more) in Italy . In the IAAF World Cross Country Championship (more) held in Punta Umbria, Spain, it was Kenya's day. Ethiopia's Imana Marga won the men's individual title but Kenya scorde a convincing team win with the next four finishers. In the women's race Vivian Cheruiyot led Kenya to team gold. It was only in the Junior women's event where Ethiopia prevailed over Kenya in a closely-scorde competition, while the result was reversed in the Junior men's race. In the South Atlantic the world's most southerly certified marathon, the Stanley Marathon (more), was run in the Falkland Islands. As we know, a terrible tragedy is unfolding in Japan, after the strongest ever earthquake suffered some days ago, the following tsunami and the on-going nuclear dangers, the consequences of which are unclear even to specialists. The enormity of this catastrophe is as yet unknown. Japan is one of the countries most involved in our sport and the history of AIMS has been directly linked to Japan through a long-serving President, Board members, race directors, sponsors and runners. Each of them has always shown goodwill, solidarity and fair play in all they do and through sometimes adverse circumstances. The current dramatic situation has brought out their civic qualities as an example to all of us. AIMS does not have the possibility of directly setting up a fundraising operation or gathering material assistance; nevertheless, we hope to contribute by urging our all our member race organisations and their localities to use the mechanisms set up by their governments or NGOs and contribute as much as possible to assist Japan's recovery. AIMS, and our friends in Japan thank you in advance. 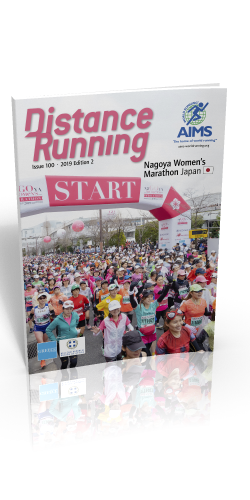 12 March: Nagoya Marathon which was to have been held on 13 March but has been cancelled because of the devastating earthquake in Japan, was to have been the final qualifying race for the women's team in the upcoming World Championships in Daegu writes Ken Nakamura. With the cancellation, several elite runners, such as Yuri Kano, Yurika Nakamura and Yoshiko Fujinaga, have missed their opportunity to qualify. To give these runners a second chance, JAAF has announced that the another World Championships marathon qualifying race will be designated soon, probably on March 15. It is most likely to be in April, and the top candidate is Nagano Marathon, but it is possible that an April marathon abroad may be designated as the qualifying race. The 32nd Nagoya International Women's Marathon, which was due to be held on 13 March, has been cancelled due to the devastating earthquake in Japan. In the Lake Biwa Mainichi Marathon (more) in Japan on 6 March Wilson Kipsang set a new course record of 2:06:13, beating Deribe Merga by three minutes. In the Barcleona Marathon (more) Levi Omari Matebo won by almost as much with 2:07:31. Dereje Dene won the Lago Maggiore Half Marathon (more) in exactly one hour, with Joyce Chepkirui taking the women's race in 1:11:17 - both of them being only a few seconds ahead of the second and third finishers. Stephen Kibet won the Semi Marathon de Paris (more) in 1:01:36, while Peninah Arusei won the women's race. Rounding out the day's running the Lala Marathon (more) took place in the Mexican city of Torreon, at 1100m altitude. 2011 event has been cancelled due to the uncertainty of the political situation there. On 27 February Hailu Mekonnen stepped into the gap left open by Haile Gebrselassie's late withdrawl to win the Tokyo Marathon (more) in 2:07:35, just 12 seconds slower than the course record. Tatyana Aryasova breezed past longtime leader Yoko Shibui at 40km, to win the women's race in 2:27:29 as Shibui faded to fourth. Three AIMS events were held in Africa: the Kilimanjaro Marathon (more) in Tanzania; the Sunyang Eco-healing Seychelles Marathon (more); and the Maritzburg Marathon (more) in South Africa. The 14th edition of the Verdimarathon (more) was held in Salsomaggiore, Italy, the World Best 10km (more) took place in San Juan, Puerto Rico, and the Sao Paulo International Half Marathon (more) was run through the streets of Brazil's biggest city. With five continents represented by races on Sunday a sixth - Antarctica - takes the stage on 28 February, with the Antarctica Marathon (more) being held on King George Island. On the same day, but a climatic world away, the Sahara Marathon (more) is run through the Sahrawi refugee camps of south-west Algeria. 24 February: At 16.04 today, the Marine Corps Marathon (MCM) sold out all available online entries in just 28 hours and 4 minutes, the fastest sell-out yet. The previous fastest was in 2005, when the event sold out in 62 hours and 9 minutes. Runners rushed to register for the 36th edition as soon as it opened to the public at 12.00 on 23 February, the date that commemorates the flag raisings at the Battle of Iwo Jima during WW2. Runners still interested in participating in the 2011 MCM can register to run with one of the MCM Charity Partners by linking to the charity page of www.marinemarathon.com. More than 70 organizations have reserved blocks of entries to the event. "Running for a charitable cause adds an entirely new level of inspiration to the experience," adds Nealis. "With a wide variety of charities to choose from, runners will have no challenge finding an important cause to support." The 2011 MCM will welcome 30,000 registered participants on 30 October 2011. 24 February: The BMW Berlin Marathon has sold out its 40,000 places earlier than ever before. Only 1000 bib numbers are left, all of them charity entries at a price of 142.195 euros, of which 42.195 euros are to combat childhood poverty in Germany (via “RTL Spendenmarathon”, a charity organized by TV company RTL). Last year the marathon sold out on 20 April. The race itself - the 38th edition - will be held in seven months' time, on 25 September. 22 February: One week ago the new Osaka Marathon opened for entries, the second mass marathon to be started in Japan, following the popular success of the Tokyo Marathon over the last few years. The success story continues in Osaka, as on the very first day, 15 February, 32171 entry forms reached the Organising Committee. At such a rate of application 200,000 applications could be received by the closing date, 15 March. Participants will be selected by lottery. On 20 February the second edition of the Yokohama Women's Marathon (more) yielded some fast times, with perhaps two of the World Championship places being taken up. Elsewhere in Japan the Ohme Hochi 30km (more) race was run. In the 15th edition of the Standard Chartered Hong Kong Marathon (more) record numbers took part with over 10000 finishers in the full marathon and 55,000 more in the supporting events.. In Europe the Limassol Marathon GSO (more) (CYP) celebrated its 5th edition. The 10th anniversary Baxters Loch Ness Marathon and Festival of Running takes place on 2 October 2011, but with the closing date for the general entry only 10 weeks away, organisers are calling on everyone considering a long distance run in this "Year of Active Scotland" to sign up quickly. To mark this special 10th anniversary year, runners participating in the 2011 marathon who have completed all previous nine Loch Ness Marathons are invited to register for a unique memento to be awarded at the finish of the 2011 run. Malcolm Sutherland, Race Director of Baxters Loch Ness Marathon & Festival of Running, said: “We would like all runners who have finished all nine Loch Ness Marathons to get in touch with us and let us know, so as we can invite them to join our anniversary celebrations at the event on 2 October – we know there are a few of you out there! The Loch Ness Marathon is a favourite with people across the UK and beyond and we are looking forward to welcoming runners old and new to this year’s event. Everyone thinking of running should visit www.lochnessmarathon.com now to be sure of a place.” Entries are open for the 2011 Baxters Loch Ness Marathon, River Ness 10K, 10K Corporate Challenge and 5K Fun Run, all taking place on Sunday 2 October. Entry is guaranteed for all marathon runners until 1 May or sooner if race limit reached; charity and club runner places will be available after this date. Visit www.lochnessmarathon.com now to book your place. In the In the Ras Al Khaimah Half Marathon (more) (UAE) held on 18 February Mary Keitany ran the fastest ever time on an "unassisted" course, 1:05:50, breaking the mark set by Lornah Kiplagat in Udine in 2007 by 35 seconds. Only Paula Radcliffe (1:05:40) and Susan Chepkemei (1:05:44) have run faster, but on downhill courses. Keitany finished a kilometre ahead of her nearest rival, Dire Tune after passing through 5km in 15:18 and 10km in 30:40. Deriba Merga won the men's race in 59:25, with Bernard Kipyego and Leonard Langat also under one hour. On 20 February the Standard Chartered Hong Kong Marathon will strikingly illustrate just how much distance running has boomed writes Pat Butcher. Born in 1997, the first edition just prior to the British handover of the former colony was run from Kowloon into the mainland city of Shenzhen, with fewer than 1000 competitors. This year’s 15th edition, entirely within Hong Kong, will feature around 65,000 runners in three events: 10km, half-marathon, and marathon, with the marathon expected to top 10,000 starters for the first time. Most are starting with the 10km (37,000 entries), since both temperature and humidity can land runners in uncomfortable territory, and the marathon course also features sapping gradients through the Western Harbour Tunnel towards the end of the race. Course record holder Cyprian Kiagora (2:14:57 in 2009) returns this year in pursuit of a hat-trick; the women’s record belongs to Dai Yan Yan of China, who ran 2.34.41 in 2005. Race day weather promises to be mild, between 12-16C, and to offset the stretch through the tunnel, the early stages of the marathon go out and back over the spectacular Tsing Ma suspension bridge, which has a span of 2.2km. The race begins in Kowloon, and after negotiating the bridge and tunnel, ends in Victoria Park on Hong Kong island. In the 27th edition of the Maraton de la Ciudad de Sevilla (more) on 13 February a record 4853 runners took part. Daniel Abera Wedajo won the men's race in a new course record of 2:09:53. The 5th edition of the RAK Half Marathon on 18 February promises best-yet line-ups in both men's and women's fields, with nine of the elite men’s field boasting best times under the hour, and Mary Keitany leading the women's field including 10 other women who have run under 70 minutes. Overall entries are higher than ever at 2600 and the fast, flat course, with a turnaround point before 15km, allows them a privileged view of the elite competition as it hots up in the later stages. Berlin Marathon winner Patrick Makau (KEN) headlines the deep men's field. The 25 year old Kenyan holds the third fastest half marathon time yet recorded, with his 58:52 victory in his second RAK win in 2009, after winning the previous year in 59:35. He opens his 2011 racing campaign after a fabulous 2010 run of form included wins in the Rotterdam Marathon (2:04:48) and Berlin (2:05:08). His half marathon average, over 10 races, is 59:26. Bernard Kipyego (KEN) could be Makau's nemesis. With ‘only’ four performances under the hour he is a rank outsider, but with sub-27 minute speed for 10000m on the track, he could possibly blow the favourite away in the closing stages. Behind this big pairing Deriba Merga (ETH) will be thirsting to restore his status. With a 59:15 best topping six sub-hour results (including two third places in RAK) he disappointed at the end of 2010 by dropping out of two marathons. If his thirst for competition has been reigned in sufficiently since then he could yet return to form in RAK. Wilson Chebet (KEN, 59:15), John Kiprotich (KEN, 59:23), among others, could also figure in what promises to be a toxic mix of flat-out running and cool judgment on the long home straight. In the women's race Mary Keitany seldom loses or runs slow times. The 2009 IAAF World Half Marathon champion has broken 67 minutes three times and the average of her best 10 half marathons is 67:57. RAK presents an opportunity for her to take a shot at the world record (1:06:25) set by Lornah Kiplagat (NED) in Udine in 2007. Keitany finished second in that race, 23 seconds behind, but in October 2009 ran 1:06:36 to win the IAAF World Half Marathon championships in Birmingham (GBR) on what can only be described as a "challenging" course. Second in last year’s RAK Half Marathon, Ethiopia’s 21-year old Mare Dibaba is also ranked World no.2, and could challenge. Her compatriots Dire Tune and Aberu Kebede will also be challenging. 10 February: The seventh edition of the Geneva Marathon for Unicef, to be held on 15 May 2011, will offer runners a single lap route incorporating the most beautiful landmarks of the city as well as Geneva’s historical centre and the magnificent surrounding countryside. In previous editions participants had to complete two loops of the same course, but the 2011 route is a single loop offering both full and half marathon runners a variation of vistas to help them on their way. After the first part through stunning countryside nestling between Jura crests and Alpine summits, runners dive into the urban landscape, discovering the emblematic monuments of Geneva (the water-jet, the flower clock, the Mont-Blanc Bridge). They will then run along the Rhône quays and cross the finish line in front of the famous Palais Wilson for a prestigious finale in the heart of the city. Drawing on the success of the sixth edition, the Organisating Committee of the Geneva Marathon for Unicef maintains the innovative format launched in 2010. Four races will be on offer so that the whole family can participate at its own pace in either a full marathon, half-marathon, 6km race for women named the Genevoise and races for children between 500m and 3km. In the Kagawa Marugame International Half Marathon (more) on 6 February Samuel Ndungu had a close win from Tsuyoshi Ugachi, 1:00:55 to 1:00:58, after race favourite and early leader Mekubo Mogusu faded in the final stages. With the late withdrawal of Elvan Abeylegsse, Kayoko Fukushi won the women's race by over a minute and a half. In the Beppu Oita Mainichi Marathon (more) Ahmed Baday kicked away from Daniel Njenga after 41km to win in 2:10:14. The women's race was contested for the first time since 1981, and won by Chiyuki Mochizuki in 2:39:57. In its rapid emergence the race has benefitted from support from both the local and international running communities, recording growth of 400% in just four years. There has been a 45% increase in the number of UAE Nationals participating. With registration now closed for the race on 18 February, a record field of 2,066 individual half marathoners and 138 relay teams have entered, pushing the total number of runners on the start line to over 2600. With overall prize money reductions as a result of the global economic downturn, the spirit of participation appears to shine through brighter than the prize pot. Almost 10% of the field flies in to the country to run, so that 89 nationalities will be represented on the start line. With the event's popularity growing year on year, organizers promise an increase in entries to be accepted for the 2012 race. On 28 January the 17th edition of the Egyptian Marathon (more) was run in Luxor, starting outside the Tomb of Hatshepsut and passing by the Valley of the Kings World Heritage site. On 30 January the elite Osaka Women's International Marathon (more) took place in Japan, race favourite Yikiko Akaba winning a long duel with Mai Ito, 2:26:29 to 2:26:55. Strong wind prevented faster times and an automatic selection for Japan's World Championships team prevented. Morocco hosted the 22nd edition of the Marathon et Semi Marathon International de Marrakesh (more). 28 January: Runners who missed out on an Old Mutual Two Oceans Half Marathon entry will have the chance to bid for one when 20 entries are put up for auction, from Thursday 3 February. Proceeds go to the official event charity and bidding will opens at R900. Interested participants can post their bid at www.oldmutual.co.za/twooceansmarathon. The auction runs for 20 days until 23 February, with one entry awarded to the highest bidder of each day. Winners will be announced the day after each bid. Winning bids will also receive a PUMA product voucher worth R1 500 and their race entry includes an ‘A’ seeding. “13 500 entries were received for the half marathon in just over two months and when entries closed in early January, there were many disappointed runners who didn’t get in. This is a way for us to help out a few of them, while also raising funds for our charity Bobs for Good,” said race director Rowyn James. There will also be five trail run entries available with bidding opening on Monday 7 February, starting at R900 and running for five days until 11 February. The auction for the ten ultra marathon entries opens on 17 March, the day after ultra entries close, with bidding opening at R900. This auction will run through until 26 March. The race takes place on Easter Saturday, 23 April. All funds raised through this initiative will go towards Bobs for Good, a local non-profit organisation, established out of the need to restore dignity and pride to underprivileged learners by giving them a new pair of South African made leather school shoes valued at R100 each. The auction was first introduced for the 2009 event and has proved to be a successful way to raise extra funds for the official event charity. 28 January: The headquarters of AIMS will be located in Athens, after AIMS President Paco Borao signed a memorandum of cooperation with the Greek Government's Minister for Culture and Sport, Pavlos Geroulanos. According to the memorandum, AIMS will promote Greece as the spiritual home of the Marathon, and a global sports tourism destination. 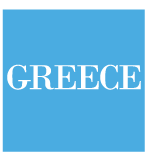 The Greek Government has undertaken to secure an office for AIMS in Athens and to supply two employees for its administrative support. "We are excited about the development, as the association that represents all marathon races and marathon runners in the world is locating its seat at the birthplace of the race. It is also bringing with it all of its values, those of liberty, democracy and personal and team effort," said Geroulanos. "We welcome AIMS and we are hoping this is the start of a long friendship," he added. "This is a natural partnership" said Paco Borao. "We share the recognition of the Marathon legend and history; we are responsible for maintaining the heritage and integrity of the Marathon movement; we acknowledge that sport is part of culture and promotes social values. This agreement gives us a new tool to meet the challenges we set ourselves in striving towards a bigger and stronger running movement". The agreement has a five-year duration, rendering Athens the global capital of marathon and distance races. For the past four years AIMS has held an annual Marathon Symposium in the town of Marathon, 40km from Greek capital, to coincide with the Athens Classic Marathon. In the Standard Chartered Dubai Marathon (more) David Barmasai (2:07:18) and Aselefech Mergia (2:22:45) took the $250,000 spoils. Mergia was robbed of a course record by strong headwinds - she finished three seconds outside it. Eliud Kiptanui dropped out while leading the men's race at 31km and Barmasai, though tiring, hung on to win. On 23 January action started with the Tainan Ancient Capital Marathon (more) in Chinese Taipei, followed by the Khon Kaen International Marathon (more) in Thailand and the Vadodara Half Marathon (more) in India. In Europe the Mitja Marato de Santa Pola (more) took place in Spain. The Maraton Internacional de Culiacan was run in Mexico before the final event of the day in Hawaii: the Maui Oceanfront Marathon (more). On 16 January the Kinmen Marathon started the action in Chinese Taipei, followed by the China Coast Marathon (more) in Hong Kong. In the 8th Standard Chartered Mumbai Marathon (more) Girma Assefa and Koren Yal won in new course records of 2:09:54 and 2:26:56 respectively but both were pushed all the way to the line: Yal by Merima Mohamed, finishing just a second adrift, and Assefa by Botor Wolde and Patrick Muriuki, who came in three and six seconds behind him. The Bahamas Marathon (more) completed action for the day. The Tiberias Marathon (more) was run in Israel on 6 January. The Zayed International Half Marathon in Abu Dhabi has been postponed until 4 March. The Mizuno Hong Kong Half Marathon Championships (more) took place on 9 January. 7 January: The Old Mutual Two Oceans 56km Marathon, to be held on Easter Saturday, 23 April, two days ago made available another 2000 places in their associated half marathon event. These have now all been snapped up, and the race entry has closed in record time (postal entries stamped on Friday 7 January by the SA Post Office will still be accepted). Disappointed applicants will need to set their sights on running the trail run, with online entries opening on Wednesday 12 January. There are two distances for runners to choose from: 10km and 20km. The trail run takes place on Good Friday 22 April at 07.30. Entries are limited to 400 participants per distance. No late entries will be accepted and no entries are taken on race day. To enter online go to: www.twooceansmarathon.org.za. 5 January: The Old Mutual Two Oceans Marathon has made an additional 2,000 entries available for the half marathon to accommodate the overwhelming response from runners wanting to take part on 23 April. The field has been extended to 13,500 in consultation with the City of Cape Town with whom various additional measures have been agreed to ensure runner safety. These include a revised finish layout to ensure better through flow of runners and an updated medical plan for both the finish and out on the route. Road running is booming with most of the races around the country during December and early January recording increased numbers. “We never expected to reach the cut-off so soon - just two months after opening,” said race director Rowyn James. Runners can enter online at www.twooceansmarathon.org.za or post their entry form to the race office. The 56km ultra marathon entries currently stand at around 1400 mark - more than twice as many as this time last year. The closing date for ultra entries remains 16 March.